I've been really into skincare lately. Back in the winter months, I was complaining a lot about how horrible my skin was. But over the summer, I started a new skincare routine, and some new medicines to help get everything back on track, and I couldn't be happier. 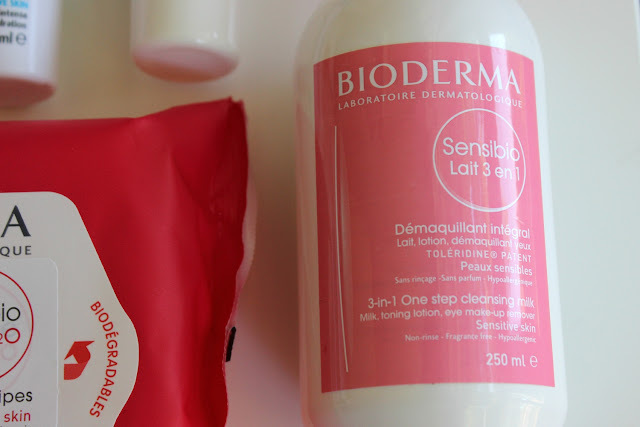 A few weeks ago, I was contacted by Bioderma (insert happy sequel). I was so excited to receive a gift package last week, and I've been testing out the products to review. Spoiler alert--I really like the brand. What I was most excited about was the cult favourite Make-up Removing Micelle Solution. Guys, I get what all the hype is about. This hypoallergenic, fragrance free, paraben free solution is a lazy girls dream for removing even the toughest of makeup. I was surprised at how effectively and quickly this removed my face makeup; no rubbing or scrubbing. It did take a little bit more effort to remove my mascara, but I'd hardly call it work. It doesn't leave any kind of residue, and it only requires a small amount of product, compared to something like the Nivea one where I find I need to soak the pad. 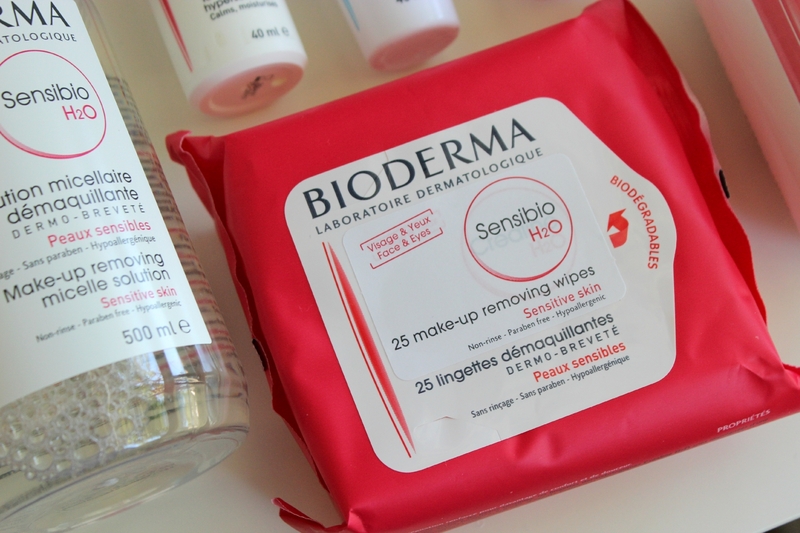 As for the Sensibio Makeup Removing Wipes, I think they did the job well, but I still prefer the micelle water. The wipes had a slightly odd, plasticy smell to them, and required a bit more scrubbing. Next is a bit of an odd ball. It's the 3-in-1 One Step Cleansing Milk. It's a very thick, milky consistency. 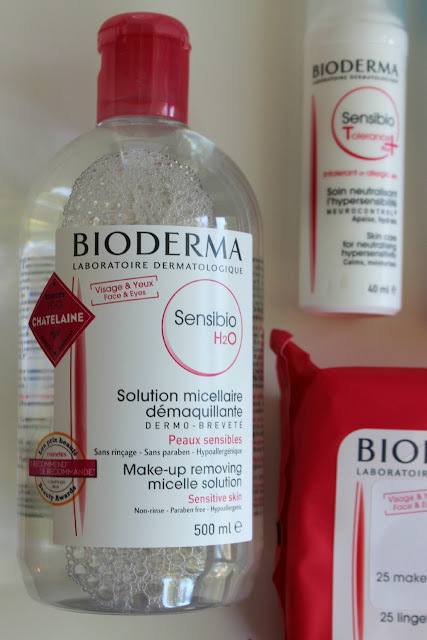 On it's own, I don't like it as a makeup remover; however, I've started using it in conjunction with the micelle water and I freaking love the combo. I drench one cotton pad with the micelle solution to remove the majority of my makeup, and squirt a bit of the cleansing milk onto a second to remove any excess. It feels amazing, quite like a cleansing balm. And the milk seems to act as a moisturizer to keep my oily but dehydrated skin feeling very balanced. I don't think that I can convey enough just how much I love the micelle and cleaning milk combo. It leaves my skin feeling so soft and clean, without feeling stripped. I don't have to worry about remnants of makeup clogging up my pores, and irritating my skin. And since it's designed for sensitive skin, I think I can happily recommend this product to anyone.